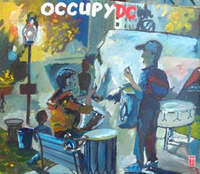 I found some lively art work down at the occupy DC encampment in McPherson Square. DC artist Ray Voide did a nice job of capturing the spirit of the encampment in his acrylic-on-cardboard paintings. The Rosa Parks banner was especially striking.